Variabilities in the responses of several South African red and green macroalgae to direct grazing and the responses of one green alga to cues from grazers were tested. We used two feeding experiments: (1) testing the induced responses of three red and one green algae to direct grazing by mesograzers and (2) a multi-treatment experiment, in which the direct and indirect effects of one macrograzer species on the green alga Codium platylobium were assessed. Consumption rates were assessed in feeding assays with intact algal pieces and with agar pellets containing non-polar extracts of the test algae. Defensive responses were induced for intact pieces of Galaxaura diessingiana, but were not induced in pellets, suggesting either morphological defence or chemical defence using polar compounds other than polyphenols. In contrast, exposure to grazing stimulated consumption of Gracilaria capensis and Hypnea spicifera by another grazing species. In the multi-treatment experiment, waterborne cues from both grazing and non-grazing snails induced defensive algal traits in C. platylobium. 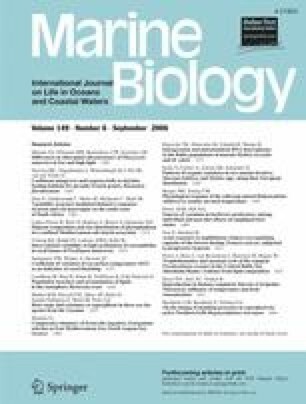 We suggest that inducible defences among macroalgae are not restricted to brown algae, but that both the responses of algae to grazers and of grazers to the defences of macroalgae are intrinsically variable and complex. Thanks are due to the Stiftung Mercator for provided funding for the project, to John Higgs for the loan of a sand filter during the experiment and to all correctors for suggestions on this manuscript. All the animals and algae used in this study were collected with the permission of the environmental affairs office of South Africa.